Mederma Stretch Mark Therapy is a topical product that is manufactured by the company Merz Pharmaceuticals. This company makes a number of topical treatments for scars and the Stretch Mark Therapy is, as the name suggests, particularly beneficial for the marks left after pregnancy and weight gain/ loss. The Mederma website is very impressive and professional in appearance. It contains customer testimonials and FAQ’s about the product, plus a ‘Learning Centre’ with further information about scars and skin markings. It is claimed that 76% of customers that used Mederma Stretch Mark therapy over 12 weeks were satisfied with the results, although, apart from some ‘before and after’ photos, there is no evidence in terms of clinical data to back this up. 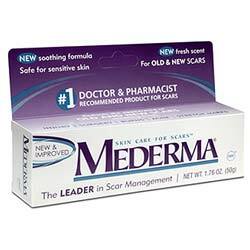 Mederma is widely available in retail stores and online, and the Mederma website includes links to these stores. One tube of the product costs $35.99 but consumers can print discount coupons directly from the website for further savings. Mederma Stretch Mark Therapy is designed to be used on all affected areas of the body, although the stomach and thighs are usually more prone to marks. Mederma is more effective on newer stretch marks and as a way to prevent marks from occurring and the manufacturer states that it may not work so well on older marks (those that have become white or silver in color). The key ingredients used in the formula are listed and explained briefly on the website. It includes a proprietary botanical blend called Cepalin, Hyaluronic Acid and Centella Asiatica plant extract. The formula is nourishing and the addition of the Hyaluronic acid is extremely beneficial in hydrating the skin. Over time, Mederma Stretch Mark Therapy reduces the severity of the marks both in size and color, making them less visible. Most users of the brand see results within 4 weeks of use, but it is recommended that consumers use it at least 12 weeks in order to see best results. Mederma Stretch Mark Therapy is certainly more useful for preventing stretch marks from occurring and on newer marks. It would be beneficial if the manufacturer’s website explained the ingredients in more detail rather than just naming them as it is not clear exactly how they work in terms of reducing the stretch marks. While this brand is slightly more expensive than some comparable brands, consumers should certainly take advantage of the discount coupons provided by the manufacturer which make it much better value for money.